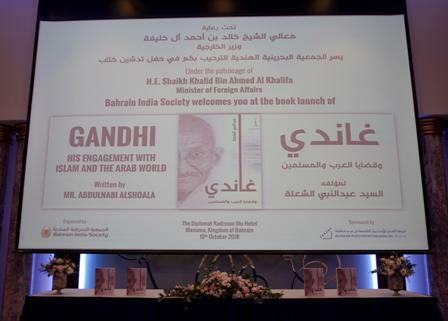 Under the patronage of the Minister of Foreign Affairs, Shaikh Khalid bin Ahmed bin Mohammed Al Khalifa, an inauguration ceremony was held for Abdulnabi AlShoala’s book "Gandhi ... Arab and Islamic Issues". 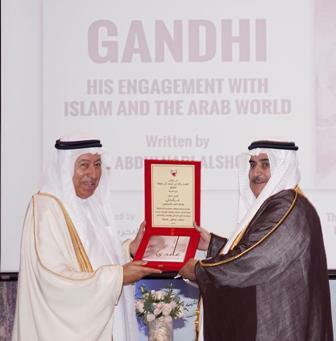 The ceremony was in the presence of Shura Council Chairman, Ali bin Saleh Al-Saleh, Ambassador of the Republic of India to the Kingdom of Bahrain, Alok Kumar Sinha, and the Chairman of the Bahrain-India Society, Mr. Mohammed Dadabhai. 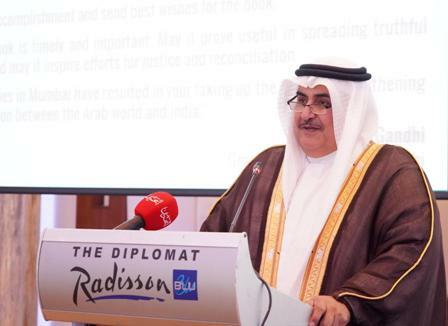 For this occasion, the Minister of Foreign Affairs delivered a speech in which he praised the author Abdulnabi AlShoala's keenness to highlight the Republic of India, its people, and culture, stressing the depth of the long-term relations between the Kingdom of Bahrain and the Republic of India. 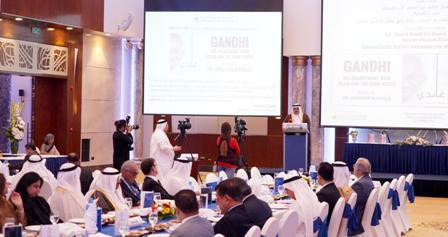 The Minister of Foreign Affairs also pointed out that this ceremony reflects the appreciation of Mahatma Gandhi’s role in strengthening the Republic of India’s relations with Arab and Islamic countries, as well as an invitation to reflect on his life and inspirational achievements, not only in the Republic of India but also in the region and the world. He added that extremism, violence, and conflicts in the region today threaten to undermine the life of peaceful coexistence and tolerance that people of the region have always known. He further stressed the importance of learning from the values and principles that Mahatma Gandhi embodied in his support for the collective efforts aimed to achieve peace, progress, and prosperity.